Psst…. want a blind date? The Wolf (also known as GI Wolf * and Pvt. Wolf (Private Wolf), created while Sansone was stationed at Fort Belvoir, appeared in DUCK BOARD. It was so popular that Sansone was transferred to CNS (Camp Newspaper Services) in NYC until the end of the war. The Wolf appeared in over 3000 publications, articles and features. The Wolf grew in notoriety after Sansone was in featured in a LIFE Magazine article in 1944. The Wolf book was published in 1945. *GI and Pvt are US Army rank abbreviations for members of the US armed forces. The Wolf cartoon was often labeled or identified with the same or current rank as its creator Leonard Sansone from GI Wolf – a member of the US armed forces or Pvt Wolf – the first rank. Leonard Sansone’s ranks progressed to CPL (corporal) and SGT (staff sergeant). Sansone was first stationed at Ft. Belvoir, VA. He went from basic Engineer training to serve as artist on the Camp Newspaper Duck Board. Sansone created his Wolf cartoons, did illustrations and drawings, typography, layout and served as editor and art director during his stay there. 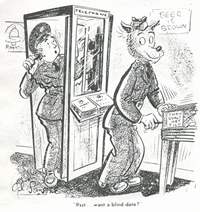 His Wolf cartoons became so popular, that after nine months at Ft. Belvoir, he was transferred to the staff of Camp Newspaper Services (CNS) a subsidiary of YANK) located on 42nd street in Manhattan. 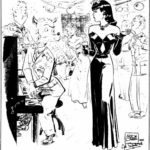 Milton Caniff and Leonard Sansone collaborated on many cartoons during WWII during their years with CNS (Camp Newspaper Services) located at the YANK magazine headquarters in NYC. 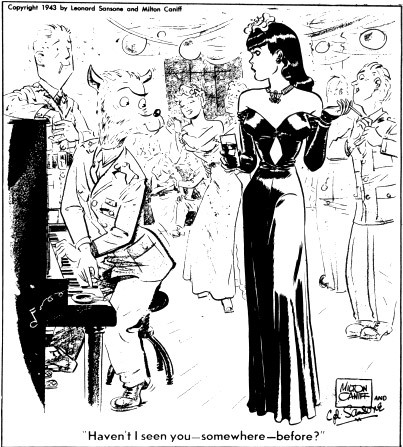 Here is a panel in Caniff’s popular cartoon strip Male Call that features Sansone’s GI Wolf. 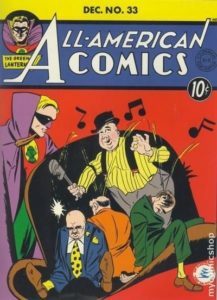 This section contains some examples of vintage comic books, covers, and a few pages with references to Leonard Sansone in credits as artist, creator, colors, inker, penciler. Leonard moved to Miami with his wife, Emily, and their new baby, Peter, from Massachusetts in 1947. They bought their first house in West Miami. Their second child, Maggie, was born in 1949. Lenny continued to work as an advertising artist and cartoonist. 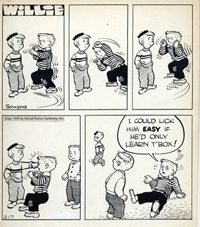 He created the cartoon strip Willie (Willie daily), a United Feature Syndicate, that ran from 1949 to 1956, and co-owned The Florida Advertising Art Agency located in Coral Gables. Emily worked as a copywriter at Burdines department store. Contact the webmaster for permissions and details about all images on this site.